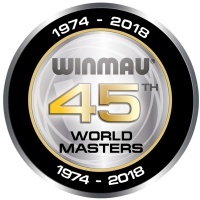 With the August 30th cut off date looming, time is running out for players to earn automatic qualification for this year’s Winmau World Masters, the world’s longest running darts major. Since our last update, there has been little change at the top. It’s at the bottom of the BDO’s ranking table that attention turns as players fight to earn enough points for one of the 16 automatic qualification seed places. Last weekend’s category B events in Antwerp provided an opportunity to climb the ladder. However, of the players clinging onto the top 16 position, or fighting to climb the rankings, few either chose to take part or failed to make an impact. With events in Sweden in a couple of weeks likely to provide a final automatic qualification chance for Winmau Masters hopefuls, Dutch player Derk Telnekes has dropped out of the top BDO 16 rankings. He slides three places to 17th and is replaced by England’s Scott Baker, who moves into 16th. Helping to securing their positions are Chris Landman and Michael Unterbuchner who move up three places each to 10th and 12th respectively. Also giving himself a little breathing space is Welshman Martin Phillips who climbs two places to 14th in the BDO list. Amongst those still hoping to qualify for the 45th staging of the Winmau World Masters, which takes place at Bridlington Spa, Yorkshire on October 4 to 7, is Conan Whitehead. Currently sitting 18th, he picked up 16 points by finishing third in the Antwerp Open and is just 12 points off an automatic qualification spot. Just two points behind is fans’ favourite, Tony O’Shea. In the Ladies race to the Winmau World Masters, in which eight automatic qualification places are up for grabs, there’s little change in the ranking tables. Deta Hedman still trails leader Lorraine Winstanley despite winning the Antwerp Masters. 10-times world champion and Team Winmau player, Trina Gulliver MBE remains just outside the top eight despite picking up points in Antwerp. Behind her in 10th is previous World Masters semi-finalist Maria O’Brien. Check in with us at the end of the month to see if results in Sweden will ensure there is a twist in the tail as the race to the Winmau World Masters enters the finishing straight.